Thirty-four forest rangers and a dozen volunteers saved a hiker’s life after he injured his leg on an icy cliff on the remote Saddleback Mountain in the High Peaks Wilderness in early February. 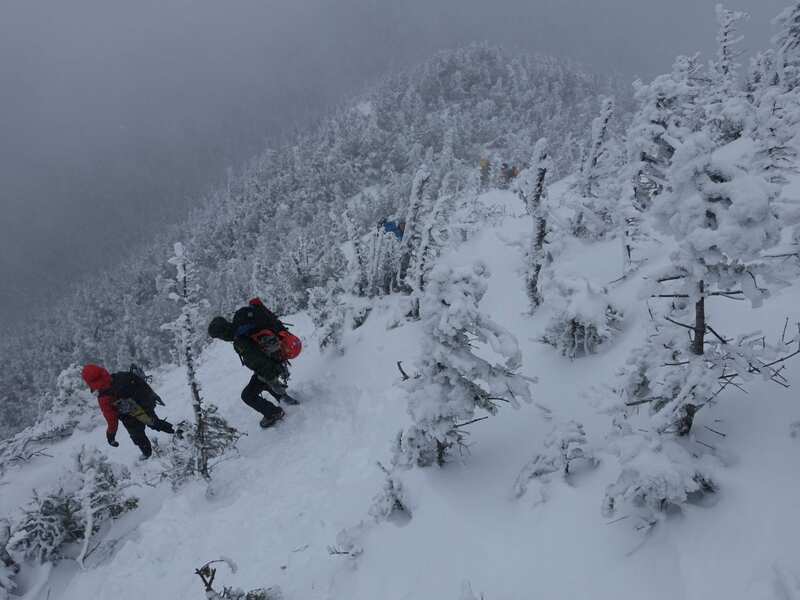 The rescue took about thirty-seven hours to complete, starting with the emergency call placed by the injured hiker’s friend at about noon on Saturday, February 3, and ending at 1 a.m. Monday when he was put in an ambulance near the Garden parking area in Keene Valley. 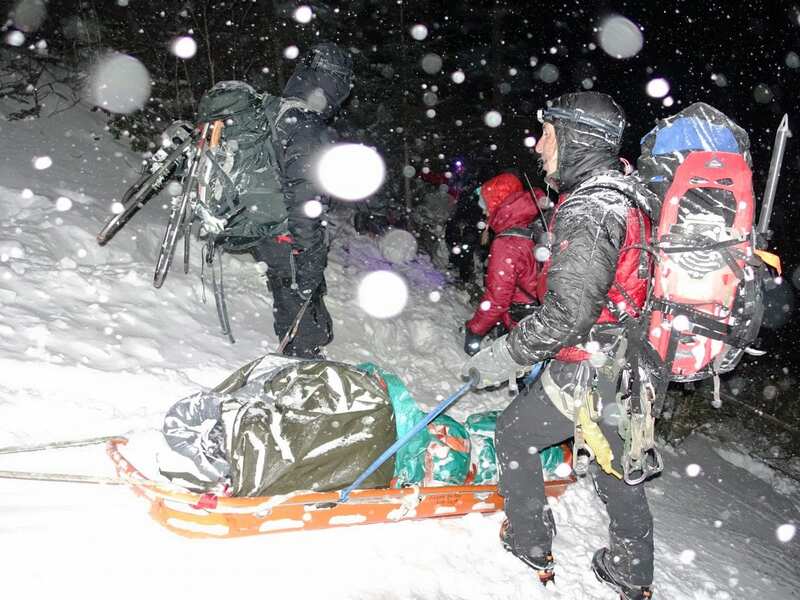 Rangers Scott Van Laer and Rob Praczkajlo were the first searchers to reach the hiker and his friend—at 4:45 a.m. Sunday after a five-mile trek through deep snow and icy terrain. Van Laer said the hiker was alert but shivering and mildly hypothermic. The rangers treated the injury and put the hiker inside a bivy shelter with a sleeping bag and heated blanket. The hikers had made a snow shelter and were well equipped for a day hike but didn’t have overnight gear. “He stopped shivering within a half an hour and then was asleep an hour later,” Van Laer said. Van Laer said the temperature was in the single digits, with winds of about fifty miles an hour. Initially, seven rangers set out from the Ausable Club to rescue the hiker, who was in the col between Basin Mountain and Saddleback. Two rangers turned back after helping to transport gear. The other five intended to climb Basin Mountain from the Warden’s Camp between Lower and Upper Ausable lakes and then drop down to the col. However, one got hurt on Basin at about 2 a.m. Two of the other rangers stayed to help him. Van Laer and Praczkajlo pushed on alone. Because of the incident on Basin, Van Laer and Praczkajlo had left behind some of their gear, including a tent, stove, and extra water. After spending eight hours with the injured hiker, they started to worry about getting hypothermic themselves. At noon Sunday, they headed out of the woods (the two hikers were in sleeping bags). Three hours later, a seventeen-person team, consisting of rangers and volunteers, arrived with a rescue sled. After packaging the injured man in a sled, the teams began lowering him down Chicken Coup Brook, a drainage that would lead them to the Bushnell Falls lean-to and eventually the Johns Brook caretaker’s cabin. The original plan had been to go back out over Basin Mountain, but the idea of dragging the man uphill over extremely icy terrain through 50 mph winds persuaded them to use the drainage. “The winds were enough to knock you off your feet,” said Mecus, noting the forest protected the drainage from the winds. The drainage presented its own difficulties, including the first 500 feet. At this steep section, the rescuers used ropes to lower the man in three stages. For the next 1.5 miles, the terrain was less steep but still challenging. A third wave of rangers arrived to help out while the team was in the drainage. They helped get the man to the caretaker’s cabin, where he was taken to Smith Road on an ATV. “At one point, I counted 34 people on the carry out,” Mecus said. We met these 2 fellows (C & A) as we were hiking up Saddleback. They told us the route they were planning on hiking (over the back of Saddleback) and the gear that they had. Only 1 of them had crampons, the other had micro spikes, and they had a little rope. Once at the top of the mountain, we could not watch them go over the back side of Saddleback. The wind was howling and the ice was thick and the last thing they said to us was, “We hope you don’t read about us in a written accident report!” We were worried about them for the rest of the day and we got news that evening while at JBL that one of them had been hurt. We had a restless night’s sleep! We are glad that they are alive, however, they made an extremely poor decision and risked the lives of not only themselves but the rescuers…all for the sake of climbing a mountain (Basin would have been #46 for one of them). The mountain isn’t going anywhere…Hopefully they have learned from this! Thank you rescue team for your dedication! What agreat effort..Congrats to all. Sure hope the TY s are in order. This hiker was very Lucky to have so many Awesome DEC Rangers and a dedicated crew of volunteers to help them out. The Rangers take care of the mountains we love and us hikers when we need it , Thanks !!! Wow, great job everyone who took part in saving this hikers life… Kudos to you all.!! Thank God for the rangers, they’re amazing. Another person fell sixty feet off Saddleback on February 20, 1999, a nun working on the Winter 46. She and her companion had climbed over Basin and were very near the summit of Saddleback, but couldn’t quite make it. Finally admitting they’d have to give up, she turned and fell. Her life was saved only because two men from Poland happened to be camping nearby and took care of her all night while her companion hiked many miles out to get help. She had multiple injuries and had to be helicoptered out the next day, itself quite a tale; details are in my anthology, Women With Altitude, about the first 33 women to become Winter 46ers.